I need to learn how to take better food pictures. 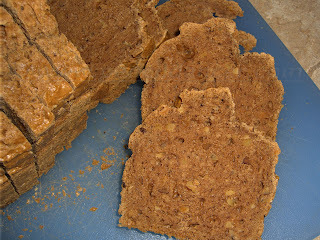 This is Scrumptious Sandwich Bread from the Gluten-Free Almond Cookbook by Elana Amsterdam. I had my doubts about this bread. It uses almond butter--if you aren't sure what that is (I wasn't!) it comes in a jar like peanut butter. I could only find the chunky almond butter. I've been searching for a good GF bread for quite awhile because the only store bought bread I like is Udi's multigrain bread and until last week I couldn't get it easily where I live. So it was experiment time. I put all the ingredients together and poured it into a special bread pan. Yes, I said pour because it looks like muffin batter. And Elana recommends a pan called the magic bread pan because it isn't quite as big as a regular bread pan. This pan gets the bread cooked all the way through. The taste was good! The chunks of almonds in the almond butter were a plus. The bread was moist and not at all sweet. Most of the GF breads I've tried have a sweet taste that bothers me. Grilled cheese doesn't work on sweet bread. I've made this three times and even though I can now get Udi's locally I will continue to make it once a month for a different kind of sandwich adventure. I'm glad you found a bread that works and that you like. Almond butter sounds yummy. Hmmmm! I will share this recipe with a friend whose SIL suffers from gluten intolerance. Love this blog, especially when you illustrate the product!!! Patti, I would recommend this cookbook to her. So far everything is turning out tasty. :) Thanks for reading and commenting. Sara, almond butter is very yummy! I ordered that cookbook from the library already! Looking forward to trying that bread. Did you know that you can get $1 off coupon on the Udi's website? I love that bread too. I found a group on Amazon that had great Gluten Free info, recipes and links. Made some really good bread myself using Rice, Garbanzo, Tapioca and Chestnut flour. No, I didn't know about the coupon, thanks! I'd like to know more about the group you found as well. Try the crackers in the cookbook too. Very good!